Battle Method - How To Win Freestyle Rap Battles & Gain Respect From Other Hip Hop MC's! "Discover How To Win Freestyle Rap Battles, Totally Destroy & Embarrass Your Opponents Whenever You Rap Even Though You Have Never Done This Before..."
...Discover How to Win Freestyle Rap Battles & Get More Girls, Be Envied By All Your Friends & Become The Most Respected & Feared Rapper In Your Town! Do you hate getting made fun of by your friends because you always lose rap battles? Do you fear going into rap battles because you fear losing? Do you get sick and tired of others dissing you just you can't come back with a solid comeback in freestyle battles? Do you want to learn the secrets to win freestyle rap battles even though you may have no experience right now? Do you want to have the power to start and destroy your opponents whenever you step into a battle? If you said YES, then you need to read this letter to find out the true secrets of winning rap battles. 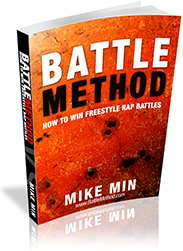 My name is Mike Min and the author of the new "Battle Method", a complete step-by-step course on how to win in freestyle rap battles. ...Throughout my experience as a hip hop enthusiast, I have really studied the art of freestyle battling from many great underground hip hop emcees, professional musicians, and even hip hop producers to find out the necessary tools to win a battle. After meeting many underground hip hop emcees, I have found out that most emcees don't like losing rap battles. In fact, almost all emcees HATE losing rap battles. That's because who likes to get made fun of for losing a battle? It's not a good feeling to get laughed at especially when everyone is around. People laughing at you can greatly damage your reputation and that can easily cause people to disregard you as a true emcee. ...Sometimes you may know how to rap but when it comes to rapping against someone else, you may stutter or not perform very well. First of all, everyone will want to test your skills in public. Once you get more popular as a rapper, more and more people will challenge you and put you to the test. If you don't know how to battle, then all that hard work to be a great rapper can shatter all at once. Second, winning battles is the fastest way to get a great reputation as a true MC. Once others see you win rap battles, your credibility will sky rocket through the roof and people will talk about you like wildfire. Winning just one rap battle can literally boost your popularity as a solid rapper. ...That is why learning how to win rap battles is so crucial if you are serious about becoming a better rapper whether it's to become a professional, amateur, or just for fun with your friends. Most rappers just rap and rhyme and think that's enough to win the battle but that is not true. In fact, there are times when the better lyrical rapper can LOSE a battle to a rapper who has less skills. That's because winning rap battles is NOT just about rhyming better. ...Instead, you need to know the other secrets and elements to win a rap battle. ...Throughout my experience in the hip hop scene, I have studied, interviewed, and learned from many freestyle rappers who were great at winning rap battles. Yes! In fact, I learned that rhyming better was just one part of winning the battle. But there were many other ways to be the winner of a rap battle. And most of the rappers that won on a consistent basis had these same characteristics to win rap battles over and over again. In fact, I have seen many rappers who SUCKED at rhyming and still won the battle not just once but over and over again. So if you have been thinking that winning a rap battle was just about rhyming better, you have been misled. There are so many other keys to winning a rap battle and I have found out that just by knowing these secrets, you can have the edge over any rapper that you are about to face in battle. Don't get me wrong. You still need to know how to rhyme. You can't just go out there and win every time using my techniques. But if already know how to freestyle in a basic way, you can be the one to win battles over and over again. Most rappers mistakenly think that the better freestyle rapper will always win. But that's not true. If you just depend on your rhyming skills, you are asking yourself to lose. That's because there are so many other mediocre rappers who can destroy you in freestyle battles because they know these insider secrets. If you just knew these little secrets, then you would have the ADVANTAGE to beat any skilled rapper in the game. The best part about this is that once you obtain these secrets, you can use them for the rest of your life and everyone around you will give you praise, respect, and adoration because you will instantly be recognized as a very good freestyle rapper. Interestingly, many of the rappers that I have talked to admitted that they weren't the best lyrical rappers. ...But because they used these insider secrets, they were able to dominate and destroy rappers with great talent and skills even when they had limited lyrical skills. So for many years, I jotted down the tips and lessons that I learned from many of these freestyle battle rappers. After years of jotting them down, I decided to compile all these lessons into ONE simple step-by-step method. ...And that is why I have recently decided to reveal all of these insider secrets in my newest "Battle Method" course. Yes! If you obtain these insider secrets that I have learned from many of the insiders to the rap game, it will be so much easier to destroy your opponents in rap battles over and over again. ...It has literally taken me over 5 years to obtain many of these proven and tested secrets to win in rap battles. I could have easily broken these secrets into different products and sold them to the public one by one. But I decided to compile ALL the rap battle secrets into one simple method. That's what my "Battle Method" contains. It contains all the secrets to win & succeed in freestyle rap battles that I have gathered from rap insiders such as freestyle rappers, battle winners, DJ's, hip hop producers, and so much more. Enjoy the satisfaction of winning something and being labeled a champion by your peers. Impress your friends and people whenever you go to parties by winning rap battles on a consistent basis. Get to have a great time with friends and other rappers. Be invited to more parties because you will be a true value to others. Learn the secret on how long to practice per day. How to prepare yourself for a rap battle. Know how to come back with better lines when you feel that you need to do a comeback. How to come up with great disses that the crowd goes crazy about. Attract the girls whenever you go to parties by showing off your battling skills. Your new battling skills will get you instant respect and admiration from other emcees, friends, girls, and even your former enemies. Be able to destroy and embarrass your opponents in public with your battle skills if you really don't like them. You will no longer be disrespected, dismissed, nor disregarded because your battle skills will prove to them that you are a man of value. You will no longer be made fun of by others and your friends whenever you spit. Your friends will admire you and want to listen to you battle others instead of laugh at you. You will also have a chance to completely destroy your friends in battles if they ever tick you off for any reason. None of your friends will ever try to mess you again because you will now have the powerful battling skills to totally embarrass them in front of others. Be able to freestyle in a group and wow the crowd. Experience the feeling of being considered the "best" whenever you are rapping with other people. Gain back the respect and admiration from people who used to diss you in the past. Enjoy music more by being a musician instead of just a listener just like everyone else. Overpower your opponents to the point that they are seriously afraid of being near you. Learn the cool "power eyes" technique to intimidate your opponents without saying a thing! Better express how you feel in your flows. Your battle skills will also help you to freestyle much better whenever you just want to spit a freestyle rap. You can be one of the few people who live their passions and dreams to the fullest. You can show people that your dreams can come true. How to intimidate your opponent so he won't perform very well. How to instantly find your opponent's weakness so he will crumble in front of the crowd. How to get the crowd to favor you over your opponent. How to use your own weakness to win the battle. How to improve your rap battling skills and experience without even going into a battle. How to succeed in freestyle rap battles faster than the average MC. How to attack your opponent so he will not have a powerful comeback. How to come up with things on top of your head. Learn how to flow in the correct sequence and structure so everything you say comes out the correct way. How to beat your opponent fast without rapping anything. How to constantly freestyle rap without running out of things to say. Learn how to find your opponents flaws and make him look so ridiculous. Discover how to make the crowd cheer you and hate your opponent. Learn how to spit faster rhymes than most other rappers. Expand your vocabulary so that your flows can sound at a higher level than your opponents. How to come up with killer punch lines that knock your opponent to the ground. Learn success secrets that 99% of other rappers don't know about that can help you have the advantage over your competitors. How to NEVER freeze up by pressure and nervousness like your competitors. How to make sense in your freestyle battle raps so that others can understand what you are saying. How to come back and win the rap battle even though you may have lost the previous rounds. How to start a rap battle whenever someone challenges you to battle. How to always be ready and destroy your opponents whenever someone challenges you out of nowhere. How to make the crowd boo your opponent. How to make the crowd favor you over your opponent all the time. How to win a rap battle even though you have less lyrical skills than your opponent. How to sky rocket your confidence so that you can dominate and destroy your opponents in rap battles. How to make your opponents fear you and thus perform badly against you. How to turn every situation into a positive so that you can always learn, grow, and become better whether you win or lose. Well...to be honest with you, it has literally taken me over 5+ years of research, interviews, and experience of meeting rap insiders to get these rap battle secrets. In addition, it has taken me over 50+ hours to actually compile, outline, write, revise, and finalize these tips into a complete step-by-step course. I usually charge $100 an hour for my personal time. So minimum, the course would cost up to $5,000 for my time, research, and writing costs. 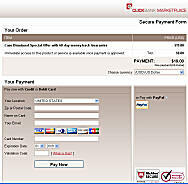 But since my business is done online, I have been able to save a lot of money on the marketing costs. Thus, I want to share that savings with you. That's right! For the price of taking a girl out on a date, you can obtain all the insider secrets to be more successful in rap battles more than ever before. In addition, you also have my 100% money back guarantee. Listen, I want you to be as confident as I am and many of my readers are. But just in case you have any lingering doubts whatsoever, I want to make it foolproof for you. Claim your copy today and read every lesson, understand every concept, read every single technique, access any resource. If you're not completely convinced that the Battle Method is worth the price many times over, then within the first 60 days just let me know and I will give you a full refund and we part as friends. So you have nothing to lose and everything to gain. Click on the order link below and claim your "Battle Method" now! "Yes Mike! I Want To Grab My Copy of the "Battle Method" System Now!" Click on the "Add to Cart" button & grab your copy now! Grab your copy now and start winning more rap battles today! P.S. If all the "Battle Method" did for you was to have the ability to win MORE rap battles than you did ever before, would that one new skill be worth the small one time price? If so, you deserve to give yourself this gift this year to start a whole new year of success! P.P.S. Remember, you have a 100% money back guarantee. If you are not satisfied with this course for any reason, just let me know and I will give you back a full refund and we can simply part as friends. P.P.P.S. Click on the order link now & download the "Battle Method" now!